A prenuptial agreement, or premarital agreement, is commonly abbreviated to prenup. It is a contract entered into prior to marriage, civil union or any other agreement. Prior to the main agreement by the people intending to marry or contract with each other. Prenuptial agreements can vary widely. But typically include provisions for division of property and spousal support in the event of divorce or breakup of marriage. 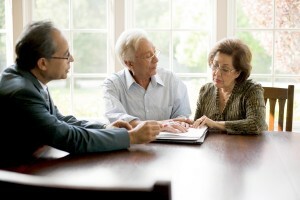 They may also include terms for the forfeiture of assets as a result of divorce. This could be based on the grounds of adultery. Further conditions of guardianship may be included as well. Whether you have an agreement or not, it really depends on how the two parties deal with each other when it comes to separating. If both can handle things in a mature and fair manner then there are usually few problems. On the other hand sometimes one or both feel they have been slighted in some manner. They may feel taken advantage of or want to gain as much in the way of assets as possible. A prenuptial agreement may help you. The emphasis is on “may”, since it really depends on the laws in your state or province. In addition the opinion of the judge and the circumstances around the reason for the divorce. Some will argue that it also depends on dependents. Also other factors such as how well the prenuptial agreement was written in the first place. The short answer is that you don’t know. If you both go into the marriage with basically nothing, you probably do not need a prenup. Since local laws are going to supersede anything that might have been agreed to anyway. On the other hand or other extreme, if you both go into the marriage with huge assets, then maybe you should arrange to have a prenuptial agreement drawn up to at least clarify what you each bring to the table. Gains in assets after the marriage have taken place are fair game. While these extreme situations are pretty clear, the folks in between with some assets or perhaps one party having a great deal and the other very limited in terms of assets are the ones that sometimes suffer. We have all read about the Hollywood types or the multi millionaires being taken for a s significant share of their wealth during a breakup. Athletes seem to have this occur to them on a fairly regular basis. Somehow you need to protect yourself from these situations even if it is to limit the damage to what might be considered fair at the time. It seems from all of the news we have read that the common sense thing to do if you have significant assets is that you should take the time to draw up a prenuptial agreement just in case. There are several reasons for making this statement. First you cannot predict what will happen these days with your marriage when over 50% in failure. Second, it is the same as taking out insurance. You hope that you will never need to cash in on your insurance policy, but you are really glad that you have a policy if you have an accident etc. Prenuptial agreements can be similar. Discussing prenuptial agreements with your spouse ! For some this can be a delicate situation. If there is some resistance and you are bringing all of the assets to the relationship, perhaps you should be a bit wary. Granted, discussing a prenuptial agreement as part of a marriage may take some of the romance out of the wedding and the relationship, it is really a business decision that can impact your personal and business wealth. Don’t allow emotions to get in the way of making these kinds of decisions. We are obviously not lawyers, just writers looking at this subject from a common sense perspective. If you feel that you may need a prenuptial agreement, talk to a competent lawyer in this field and make a decision regarding your need to have a prenuptial agreement prior to your marriage. Comments are welcome as long as they are deemed to help our readers understand this complex and emotional subject. We have all heard of two adults getting divorced and fighting over the kids. They make it sound like they want the best for the lids but is that really true? Who has access , when they have access and who can decide. Divorce and the Kids is a huge issue for all families. This is a battle that gets fought out in court. Often in family court, in front of friends and family sometimes and sometimes even in front of the kids. It is a shame when one parent will use the children as bait, as revenge, as negotiation tools in a divorce. It has gotten ugly and not to mention expensive. Any time there is a fight you can be sure that the lawyers are involved and getting paid. This is another subject. We will not dwell on it here since the real subject is all about the kids! Depending on the age of the children when a divorce occurs there can be various impacts that are hard to predict. Young children may not be impacted much, if the separation is amicable. However if there is a continuous fight between the parents, there will always be anxiety and self blame. This can increase as the kids get older when divorce occurs. They may even blame themselves for the divorce and suffer greatly as a result. Fighting over custody only makes it worse as well since this can re-enforce their anxiety about the divorce and the blame that they in turn take on. Most parents would say that they never wanted the kids to suffer, however before they know it they are in the middle of a big fight with their spouse, the gloves come off and there is a huge fight. Everything at that point becomes a question of honor of winning over the other and it includes gaining custody of the kids as well. It really is a shame, but this is reality. If only people could decide to set their fight aside, divide assets fairly and treat the other spouse with respect, everything would be better. 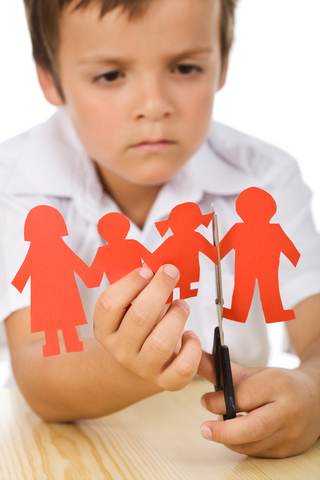 We are not saying that you can prevent divorce, but you can do a better job of breaking up in order to protect the children when there is a divorce. Many spouse are looking for revenge, they have been embarrassed, they have been betrayed and some feel that they have been made fools off. If you are going to fool around, why not get divorced first. Otherwise you are going to trigger the emotions mentioned above and this brings on a war when it comes to divorce court. One couple we know agreed to get divorced amicably and are friends to this day. They decide to put the kids first and to separate before either one of them had an affair. Since the separation, they both have had relationships. In fact the husband has been married twice and had to separate again. Through it all they both put the kids first. They made sure that they treated each other with respect in front of the kids as well as privately. We think these kids are very well adjusted. They may be a bit spoiled, since there is some competition as there always is between parents. But overall this is pretty normal. It takes a lot of control as well as maturity for both parents to act in this manner. But we think it stems from showing each other respect in the first place and not betraying each other behind their backs. Just our opinion but they seem to make it work. We would love to have comments on this blog about how you made separation work for you and your children. Yes we want comments from children as well who have a totally differently outlook on the impacts of their parents divorce on them as well. Feel free to leave multiple comments. Spam comments will be deleted. There are all kinds of issues associated with getting married for the second or even the third time. We are going to focus on some of the legal and financial issues, touch on the emotional ones and stay away from the conflict that often occurs among former spouses and even the kids. These are important issues, however they are just not the focus of this blog. More than 50 % of marriages will end up in divorce and so it has become pretty common for spouses to remarry a second or third time. The situation is complex enough between two people who are divorcing and then there is a 3rd person added to the mix. With children involved, the situation is much worse and much more complex. We are not lawyers and we write these blogs from a common sense perspective with a lot of history and knowledge gained through life experiences. If you have legal concerns, want to get a divorce or separation , we strongly suggest that you contact a local lawyer to begin working out your issues and division of assets. Divorce is emotionally draining for both parties even under the best of circumstances. Some parties can act in a mature way, divide up the assets and move on in their lives without getting into fights or contests over the assets and of course the kids. Some will even remain friends afterwords, however they just cannot live together. This is an emotional time for everyone concerned. You and your spouse, the kids, your parents and the girlfriend or boyfriend if there happens to be one. Some people will be hurt, others angry, and some will be so mad. They want to take out all of their vengeance on their soon to be ex spouse, taking them for everything they can. Lawyers are their to help you make sure everything is completed in a legal manner, however some are aggressive and antagonistic and really just feed on the process. Their objective is to make as much money as possible and if you are at war with your ex-spouse, you are just playing into their wallets. While it is easy to write this, it is much more difficult to follow this advice. The best approach by far is to come to an amicable agreement between you and your spouse. Document it and then take it to the lawyers to make it legal so that it will stand up in court! Unfortunately, many people in the heat of emotionl and anger want to punish their spouse. Some are just plain cheap and do not want to provide support for the kids. These are very hard people, who do not trust their ex-spouse and do not want to support their spouse. Take a breath, negotiate fairly and work things out. Every hour the lawyer spends on your case, he or she is charging for at somewhere between $100 to $200 per hour or even more. If you both have lawyers, the cost can be incredible if the negotiations go on for an extended period of time. I have a friend who went through this. He wanted to everything in a fair way and would not take his lawyer to the negotiations. His lawyer was upset, because it meant that he could not bill for the time spent negotiating the agreements! Make it legal, make sure it gets filed so that you are protected. It should be clear to all concerned what the agreement is for your divorce in terms of support and access to the kids. Also the splitting of assets is important so use your lawyer to make sure everything is properly documented. Avoid being greedy or being vengeful. This will just cost you more money in terms of legal fees. It will end up costing your more money than what you might have saved. We know of several couples who are living in this situation. The wife is living upstairs with the kids. While the father is in the basement were the kids come to visit. In some ways there is a practical advantage to doing it this way. The cost is kept under control since you are still only paying for one home, one set of utilities etc. However how tough can this be on the emotions of everyone? This is really not my idea of a good time. Get through the legal separation as fast as possible with a fair and equitable arrangement. So that you do not have to endure this close living situation while going through the process of separation. While you are in this situation, remain civil, avoid confrontation and document everything. What ever occurs in the home could and will be used against you in court or family law court. If you are trying to arrange a fair and equitable split, yet you are fighting all of the time, one of you might claim mental abuse or worse. This is just not a positive climate. If the marriage cannot be repaired, move on as quickly as possible. Avoid the situation from going from bad to worse. These are just some of the common sense things to consider in a separation or divorce situation. Easy to say, very difficult to do and follow-up on in real life. At least from reading this post you will have some idea of what you can do to make it better. Also to make the transition easier. If you have comments on this post or your own ideas about this difficult situation, feel free to leave a comment. Spam comments will be erased.